Through an interactive, dynamic new interface, along with technology that enables integration of Citeline content directly into your workflow tools and our Citeline Partners’ solutions, you can design and run the Next Generation of clinical trials to achieve optimal commercial outcomes with less risk and cost. Reliable clinical trial intelligence is essential to successful drug development. 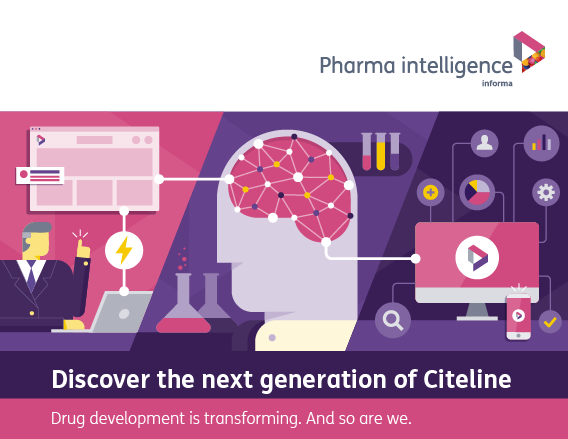 Citeline has been your partner for over 35 years, with our team of analysts living and breathing drug development data, cutting out the noise and delivering you the intelligence you need to drive successful R&D. But drug development is transforming, and so are we. In partnership with you, driven directly by your feedback, we have redesigned Citeline to better solve the most important challenges you’ve shared with us. The new application programing interface technology (APIs) lets you put Citeline content in any software or analytics tool to advance your R&D. We’ve also launched a new Citeline Partner Program, with foundational partners goBalto and DrugDev, to leverage our Citeline content in their solutions to benefit our mutual clients. The new Citeline solutions and partnerships allow you to enjoy the same depth and breadth of specialized, high caliber content, now delivered the way you want to better fit you needs, internal solutions, and workflows. The result: Enhanced data and insights, delivered to you on your terms. The outcomes: Better clinical trials for better health outcomes. Faster searches. Deeper insights. More customized results. A new way to access the industry’s most comprehensive, accurate and up-to-date clinical trial intelligence. Improve clinical trial success and reduce costs with the Next Generation of Citeline’s Trialtrove and Sitetrove. Spend less time looking and more time planning: Perform more accurate, insightful and faster searches with amazing new filter and query capabilities. Stay on the cutting edge: With real-time updates. Customize data your way: With enhanced visualizations features. Drive transparency across your organization: By sharing your searches with others. Get answers to your business-critical questions: With Ask-the-Analyst, you have direct access to our team of experts. And coming soon: The Next Generation of Citeline’s Pharmaprojects. Quick access to reliable, vetted information is your key to understanding the competitive landscape and other market forces to optimize the success of your clinical trials. We understand that you must often look to multiple resources and leverage a variety of solutions to ensure you have the full picture – which is why we created the Citeline Partner Program. By integrating Citeline content into our partners’ solutions, our mutual clients will benefit from an unparalleled breadth and depth of trusted, integrated intelligence. 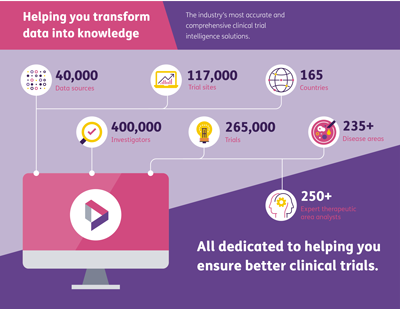 Citeline’s nearly 400,000 global investigators – paired with DrugDev Spark’s proprietary investigator network, feasibility tools, and Golden Number universal identifier – saves time, improves accuracy, and expands access to more viable options in the selection of high performing sites. Citeline’s gold standard drug, trial and clinical investigator intelligence paired with goBalto’s award-winning Select, which weighs selection and performance variables, reduces your risk of selecting non-active, non-enrolling sites and ensures accurate identification of target populations ideally suited to your studies in clinical trials. Pharma Intelligence. Copyright © 2017 Informa Plc.